Bruce Anstey won this afternoon’s Sure Lightweight Classic TT race in record-breaking fashion, the Valvoline Racing by Padgetts Honda rider dominating proceedings from start to finish as he recorded the fastest ever lap by a 250cc machine around the Mountain Course. Anstey’s second lap speed of 118.744mph was over four seconds quicker than the 118.29mph lap set by John McGuinness way back in 1999 and it enabled him to take victory by over a minute from Ian Lougher on the Laylaw Racing Yamaha. It was Anstey who led at Glen Helen on the opening lap, his lead over Lougher just 1.8s whilst he in turn only had a 0.4s gap over Ryan Kneen although the latter retired soon after at Douglas Road Corner, Kirk Michael. As the lap progressed, Anstey continued to pull away from his Welsh rival and with the margin nine seconds at Ramsey, it had stretched even further at the Grandstand and with a lap of 117.170mph, he was holding onto a 16.9s lead, Lougher’s first lap speed being 115.486mph. Kneen’s demise allowed Phil Harvey to slot into third but it was close between third and fifth as ten seconds covered Harvey, Charles Rhys Hardisty and Paul Owen. Another high profile retirement though was Dan Kneen, the Manxman stopping at the Nook whilst holding onto sixth. 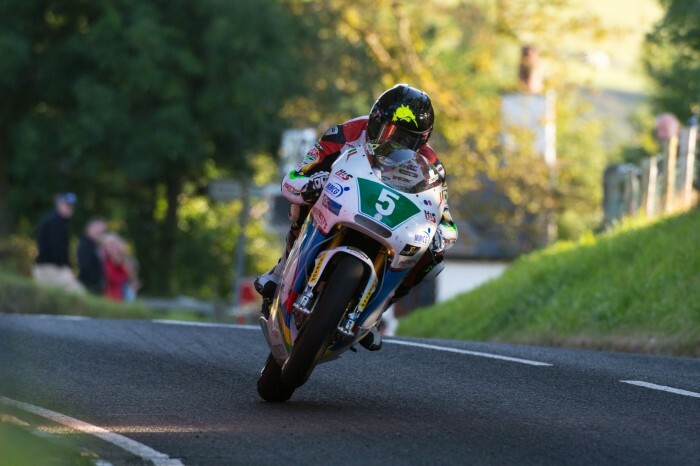 At the head of the field, Anstey was pressing on ahead adding another eight seconds to his lead over Lougher by the time they reached Glen Helen second time around. Harvey, Hardisty and Owen were holding station but sixth placed Davy Morgan was another to fall by the wayside, stopping at Quarter Bridge. Anstey was adding seconds to his lead at each timing point and little wonder – his second lap speed of 118.744mph broke McGuinness’ long standing 250cc lap record of 118.29mph. Lougher was now 43s in arrears but this had jumped up to almost a minute after the pit stops, the veteran losing time as he coasted into pit lane. Harvey had lapped at close to 113mph to consolidate his third position as Owen relegated Hardisty to fifth whilst Gary Vines, last years Newcomers Manx GP winner, moved up to sixth. As the riders started their fourth and final lap, Anstey was 1m11s clear of Lougher who was even further ahead of third placed Harvey as the top six remained the same going into the final 37 and ¾ miles. Barring disaster, the race was Anstey’s and this was exactly what happened, his last lap speed of 116.012mph giving an eventual winning margin over Lougher of 1m4s. Harvey held into third holding off a charging Owen by ten seconds with Hardisty and Vines completing the top six.